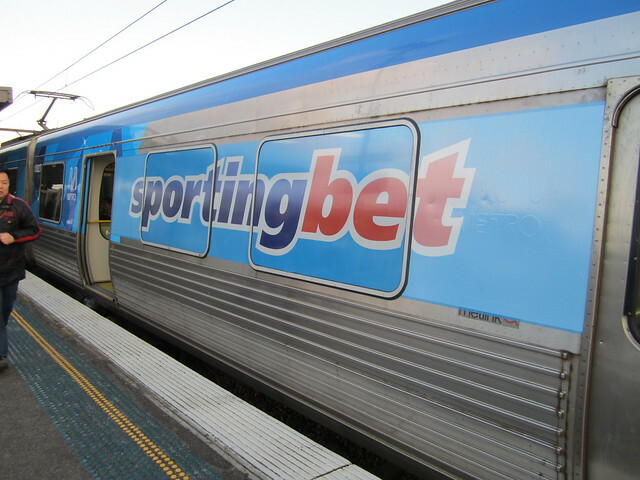 This train is rolling around with advertising for Sportingbet plastered all over it. THERE’S much disapproval of the AFL regarding the promotion of gambling to minors during game time. I eagerly await seeing equal concern at the state subsidised rail system, which now has an entire train painted with a betting slogan. Who catches trains to school? Minors. At least matches on TV can be switched off. Can we please dismiss this valueless economic model of marketing everything everywhere all the time and rediscover executives who regard themselves as pillars of the community. They would lead by example and really understand the concept of choice – such as the right not to be subjected to advertising in public spaces and the right of the community over that of shareholders. I’m unsure about this. Where does one draw the line? Do we also ban ads for MA-rated video games, MA and R-rated movies, booze, novels aimed at adults, theatre performances with adult themes, anything else marketed at adults that we don’t want children to use…? Dunno. Natural surveillance increases the threat of apprehension by taking steps to increase the perception that people can be seen. Natural surveillance occurs by designing the placement of physical features, activities and people in such a way as to maximize visibility and foster positive social interaction among legitimate users of private and public space. Potential offenders feel increased scrutiny and limitations on their escape routes. In general I have no problem with advertising on public transport if it’s unobtrusive — the revenue helps subsidise the system and fund improvements. But advertising that completely covers windows, reducing visibility is not welcome. Next → Next post: Tonight’s PTUA AGM means today is my last day as Prez. I agree with David Cathie that gambling is being shoved down our throats. But should it be banned? Probably not. Your comment about visibility is a good one. I’m surprised at the amount of gambling advertising, I guess it’s just that time of year. Southern Cross is filled with it. My problem wouldn’t be with advertising gambling to minors, it’s promoting gambling full stop. The covering the windows thing is a good point, also they haven’t (in my opinion) adequately distinguished the gambling branding from the Metro branding. It looks like they’re somehow affiliated. Visibility is especially bad on many of the route 96 trams, especially the ‘Bumblebee’ type where the fine black netting even covers the glass in the doors too, making it really hard to identify where you are at night-time given that the further part of the route at the Brunswick end is not well lit. The window issue is the same as trams with all over advertising – you ride on them and can barely see out of the window sometimes through the grid of little holes stuck on the outside! That “natural surveillance” is a rather dodgy concept. I reviewed a whole series of designs by architecture students for medium density public housing ( haha, as if that would ever happen ), and they were very keen on natural surveillance. Which apparently is code for busybodies and perverts having their interests facilitated everywhere. @enno – There are lots of examples of medium density public housing. They’re frequently built surrounding some of the Le Cobusier style blocks in the inner suburbs, and there are other sites without the highrise in outer suburbs like West Heidelberg. Can you provide any reasons why “natural surveillance” is a flawed concept other than that students think its intelligent and that “busybodies and perverts” have their interests facilitated? I wonder how the train passenger counting people, who are currently counting loads at Richmond & Sth Yarra deal with this obstruction?